The 2017 F-Pace compact is the first-ever Jaguar SUV. This all-wheel-drive crossover SUV lives happily on-road, and it can play well off-road too when the need arises. Offering generous seating for five, excellent engines, solid road manners, strong all-wheel drive (standard), stronger in-car tech (available), and plenty of luxury as you move up the price ladder, the new F-Pace is a worthy contender. Don't be scared away by the need to use premium gas. 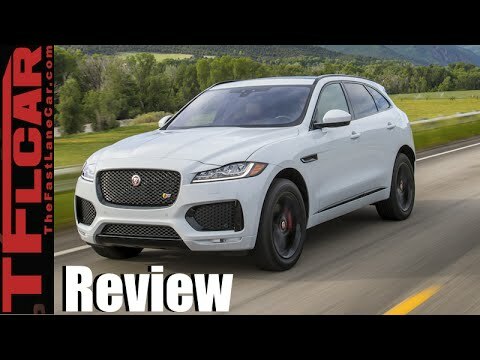 Jaguar F Pace is an extremely comfortable vehicle to drive. Performance is great. Lots of pick up but that makes it very easy to catch yourself speeding. Takes premium gas but we have found the mpg offsets the higher cost per gallon. Biggest downfall is the onboard center. Will be listening to the radio and the whole system crashes. Not often but enough to be an annoyance with the price paid for the vehicle. Jaguar should also just switch to apple play and be done with. Very fun and agile car that is great for first time SUV owners. It maneuvers extremely well around corners in country roads. This maneuverability has however come at a cost, which is the generally stiff suspension resulting in a stiffer ride than I expected. If you are looking for floaty qualify this model is not for you. If it's diesel engine, you need to put at least 2-3 gallons of DEF in the car at least every 3 months, depending on how many miles you drive. Jaguar Land Rover North America, LLC (Jaguar) is recalling one 2017 Jaguar F-PACE vehicle equipped with a 3.0L engine. A bolt used to attach the high pressure fuel pump may be too long. As a result, the fuel pump may not be properly secured and the fuel line may crack and leak. Jaguar will notify the owner, and a dealer will replace both fuel pumps and the associated fuel lines, free of charge. The recall began September 12, 2017. Owners may contact Jaguar customer service at 1-800-452-4827. Jaguar's number for this recall is H039. Jaguar Land Rover North America, LLC (Jaguar) is recalling certain 2017 Jaguar F-PACE vehicles equipped with automatic transmissions. These vehicles may have been built with a rear driveshaft that is too short, potentially resulting the driveshaft separating from the vehicle. If the driveshaft detaches, a loss of drive power would result, increasing the risk of a crash. Jaguar will notify owners, and dealers will inspect the driveshafts, replacing any that are incorrect, free of charge. The recall began May 1, 2017. Owners may contact Jaguar customer service at 1-800-452-4827. Jaguar's number for this recall is H009.